Cara shouldn’t have survived the attack. But at the last moment, a stranger snatched her to safety. In the hours that followed she told this Good Samaritan secrets she’d never told a soul. Not even her husband . 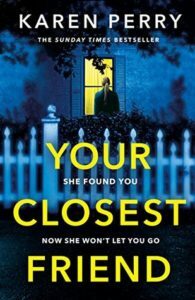 . .
A novel beginning with a terrorist attack and descending into a dark and dangerous obsession, Your Closest Friend by Karen Perry is a gripping thriller that will engross you from the very beginning. The book opens with the aforementioned terrorist attack, which sees Cara walking to the nearest tube station and finding herself in the middle of a bloodbath. Convinced the terrorist will spot her next, Cara is suddenly whisked to safety by Amy, who drags her into a nearby shop until the worst is over. With her life flashing before her eyes, Cara unburdens herself on Amy, telling her all about her family problems and the deep secret she has never revealed to anyone else. Once the coast is clear, Cara gives a statement to the police and goes on her way, thinking that she will never encounter Amy again and that their paths have simply crossed for the briefest of moments. She goes home to her husband and daughter, and returns to her work the next day as a radio producer. Of course, with the attack being front page news, Cara is placed in the limelight and persuaded to talk about it on air, with there being a caller with a very familiar voice. Thinking nothing of it, Cara talks to Amy on air and is then surprised to see her in the lobby of the building. They chat briefly and Cara returns home, finding it a bit odd but nothing more. However, Amy believes that they share a connection and continues to turn up when Cara least expects it. As their brief exchange turns into a dark obsession, Cara’s life could be turned upside down in ways she never thought possible. I found this book intriguing as it alternates perspective between both Cara and Amy, giving you an insight into both of their inner thoughts. It is clear from the beginning that Amy has problems, but we still don’t know what dark secrets Cara revealed during the attack and what she could be hiding. Does she really love her husband? Or was she meeting someone else at the time of the attack? Do we really know Cara as well as we think we do? As a character, it is easy to connect with Cara and her perspective makes for an intriguing read as we try to guess her secrets. On the surface she is calm and collected, but underneath she is struggling with her home life and in balancing her emotions. She loves her daughter and her husband, but feels like things are static and no longer stimulating. At first she finds Amy a little odd but thinks she needs a friend and tries to reach out to her. It is only later that she starts to feel like something isn’t right and that perhaps she shouldn’t have indulged Amy quite so much. We don’t get quite so much story from Amy’s point of view, as her segments are much shorter in an attempt to make her seem more sinister and unfathomable. She is an unknown, as we know very little about her other than how she starts to feel about Cara. Her obsession becomes a twisted love, as she misinterprets Cara’s signals as a sign that they are meant to be together, which only serves to ramp up her bid for attention. She quickly shows a dangerous side, with an unpredictable temperament that can turn at the flick of a switch. This makes the book a gripping read as you can never tell what Amy might do next, and there are a number of grey areas where it still isn’t clear what went on. Cara is unaware of the signals she has given off, with her secrets set to unravel at any moment. As a reader you are keen to know what she is hiding, and are always wondering if Amy’s treatment of her might somehow be justified based on what she may have done. I really enjoyed this book and recommend it as your next thriller.